Home > Query, SQL	> BISQL # 50 : SQL Server Denali Feature # 1- FileTables # 2 – Demo and Scripting Through !! Total thanks to my Shree BramhaChaitany Gondawalekar Maharaj without his power there is no success for me !! And all other friends bloggers Ganesh, Sunil, Abhijit , Vasudha and special thanks to Jacob to have faith on me !!! Lets gets hands-on to file table in practically way !! 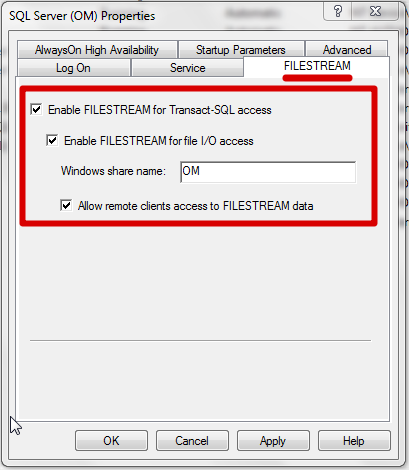 Before we start to use FILESTREAM, we must enable FILESTREAM on the instance of the SQL Server Database Engine. This topic describes how to enable FILESTREAM by using SQL Server Configuration Manager. 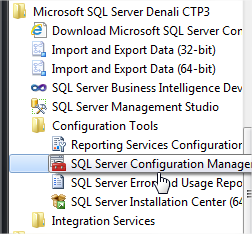 On the Start menu, point to All Programs, point to Microsoft SQL Server Code-Named "Denali", point to Configuration Tools, and then click SQL Server Configuration Manager. .In SQL Server Management Studio, click New Query to display the Query Editor. Which indicate us we have successfully enabled file stream. The simple syntax for creating a FileTable lets you specify:1.A directory name. In the FileTable folder hierarchy, this table-level directory becomes the child of the database directory specified at the database level, and the parent of the files or directories stored in the table. 2.The name of the collation to be used for file names in the Name column of the FileTable. We will have review on some more topics on Denali !! Thanks for reading my blog ! !